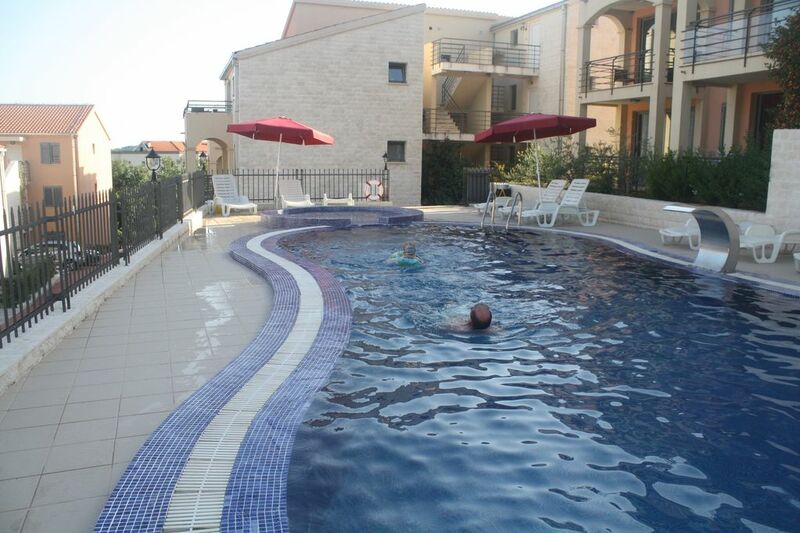 Built in 2008, this fully equipped, air conditioned 1 bedroom apartment (49.5 sq.m. ), has open plan living room, dining area and kitchen. Spacious bedroom and luxury bathroom. Access to shared pool and Jacuzzi. Parking spot provided. Balcony views of spectacular mountains, Becici Beach and world famous Sveti Stefan. Walk to 2km sandy beach in only 5-10 minutes. The old town Budva is 20 mins walk away. Kotor is 20 mins drive. Shops and restaurants nearby. We are a family (Rebecca, Charlie and Jacob) from London, UK (currently living in New York, USA) who visited Montenegro 12 years ago and instantly fell in love with the scenery, people, food, beaches and weather! As parents of a young child, we wanted an apartment close to excellent beaches and within easy reach of family-friendly restaurants. We chose Becici because it is an ideal location accessible to Kotor Bay, Budva, Sveti Stefan, Petrovaac and several wonderful beaches. Becici Sunset apartments are close enough to the restaurants and beaches to remain convenient but far enough from any noisy bars to ensure the evenings are peaceful! Becici Sunset apartments were designed to ensure guests have access to both swimming pools and central location of the cleaning/management team is very easy. As parents, we were very keen to ensure the apartment had all the facilities required to support a young family self-catering. From oven, microwave, toaster, washing machine, ironing board , to LCD TV, DVD player, WiFi internet. We have a travel cot for a young baby. As we like to use a car when on holiday in Montenegro, we have a dedicated car parking place within the secure compound ( security barrier). Luxury bathroom with shower cubicle, wc, basin and washing machine. Modern open plan lounge and dining room. Air-conditioning. 2 seater sofabeds (convert to 2 single beds). TV cabinet with 27" LCD TV (cable TV). DVD player (+some DVDs). Wall safe. Coffee table. Kitchen has electric oven and hob, fridge/freezer, microwave, toaster, water kettle, coffee maker and all cooking utensils. Breakfast bar with 4 chairs. High chair can be provided. Kolashin 1450 ski resort, the leading ski center in Montenegro is a 2-3hr drive north of Becici. The drive follows the Tara river for large stretches and takes you through the beautiful Bjelasica mountain region. The ski resort has recently been upgraded (winter 2008) to include 4 new Alpine ski-runs with a new 6 seat cableway chair lift and a Nordic ski-run. There are over 40km of trails at your disposal. Highest point is at 1880m. Runs are predominantly reds and blues. Kolashin is an attractive resort with several cafes, restaurants and bars with at least two 4-5* hotels recently opening in the resort. Next largest ski centre in Montenegro is Zablyak (Durmitor National Park) ski resort within 3.5 hours drive. Notes on accommodation: 2nd (top) floor. Air-conditioning, oil radiators. Smoking only allowed on balcony. Travel cot available in apartment. Baby high chair available through our agent at 10 euros a week (please state when booking). Outside: 2 large shared pools and 3rd small jacuzzi pool with loungers and parasols. Reserved car parking space (Number 10). Utility Room: Ironing board, steam iron and clothes dryer. Cleaning / Towels / Linen / Maid service: All the bedlinen and towels are provided. Other: Table and 4 chairs on the spacious balcony for enjoying views of pool, Jacuzzi, mountains, Sveti Stefan and Becici Beach. This apartment had everything we needed and more, it lacked for nothing and was really clean. We arranged transport from and to the airport through the owners and was great service. The complex manager was always around and very helpful. The pool area was clean and we never struggled for a lounger. The only down side was the location, an easy walk down but a bit rough getting back up the hill. Would recommend Boko tour through Montenegro Tours, 15 euros and Blanche restaurant which is a short taxi ride away, about 8 euros but well worth it, amazing food and views. A short drive to Budva Old Town (2-3km), UNESCO protected Kotor (30km) and Skadar Lake (25km) one of the biggest bird species habitat in Europe. Tara River, one of the most beautiful Montenegro rivers, between the Bjelasnica, Sinjajevina, Ljubisnje and Durmitor mountains. The famous, sandy beach of Becici (5-10 mins walk away via the stairway) is one of the nicest beaches on the Riviera of Budva (provides parasols/sun loungers). A short drive away are other beautiful beaches and coves in Montenegro: Przno old fishing village and cove (2km), Sveti Stefan (4km) and its magical Queen's and King's Beaches, pristine Jaz (4km). Further east along the coast (60 mins drive), is the beautiful white sandy beach of the Velika Plaza at Ulcinj. Tivat Airport is about 20km away, Podgorica airport 50km and Dubrovnik Airport about 120km away. Flights from the UK to Dubrovnik are frequent. Flights to Tivat and Podorica from Heathrow, Gatwick and other European airports are ideal given proximity to villa (check BA, JAT, Montenegro Airlines). Can also reach via ferry from Bari, Italy. The old town Budva is easily reached from Becici using the beach promenade/path in 20 minutes, or by car - only 2-5 minutes, by taxi or line bus - 5-10 minutes, by boat 5-10 minutes. The town Kotor is 30 minutes drive away, Petrovac - 15 minutes drive along the coast. There are many rent-a-car agencies at your disposal in Budva for those who want to discover the area on their own. Excellent waterfront restaurants offering both local and international cuisine are a short stroll away including Tri Ribana, Porto, Porat, Promenada (Japanese+Tapas). Luxury spa and gym facilities of Hotel Splendid. Budva has hosted international music events over the last few summers with Madonna and the Rolling Stones performing at Jaz Beach in the last 2 years. Booking Notes: Deposit of 50% required at time of booking and full balance 4 weeks before departure. Payment methods are bank transfer, PayPal (inc debit/credit cards). Funds must clear prior to the start of your holiday. Security deposit of 200EUR required on arrival at apartment. This is returned on check-out. Cancellation refunds: >8 weeks – 100% refund. 4-8 weeks - 50% refund. 2-4 weeks - 25% refund. <2 weeks - none. Also required at check-in time is a 200euros damage deposit, returned at the end of your stay, subject to damage and loss, checked after your stay by our rental management agen Changeover Day: Saturday/Sunday are the preferred changeover day but can be flexible. Access to the apartment is from 3pm and departure from the apartment is at 11am unless previously agreed with the owner. If no previous guests then access can be arranged earlier. Notes on prices: Prices shown are for the property per week in GBP. Prices for longer or shorter rentals can be negotiated so feel free to get in touch and discuss. Prices per apartment are based on 2/4 sharing. Minimum 3 night stay.